Big Ma Ma golden Mantis is my love of nature and she knows me!! Big Ma Ma golden Mantis is my love for nature and she knows me!! August is slow and not one praying mantis have come to visit me; every August I wait for Big Ma Ma golden Mantis to come visit me after laying her egg sack. (This is in case you don’t already know this… dear reader). “Goodbye until we meet again in Spring…sweet autumn is near.” Is what she always seems to tell me. Today the outside sewer drainage pipe ran over and the bowels of hell came forth. I rolled up my pants and got to work cleaning. The rubber pipe outside is under the Praying Mantis tree with purple flowers. I called Mr. Faucetman to drill the sewer line. I don’t think Lance is going to fit under this tree. So after shoveling, digging and cleaning, I trimmed the tree back. 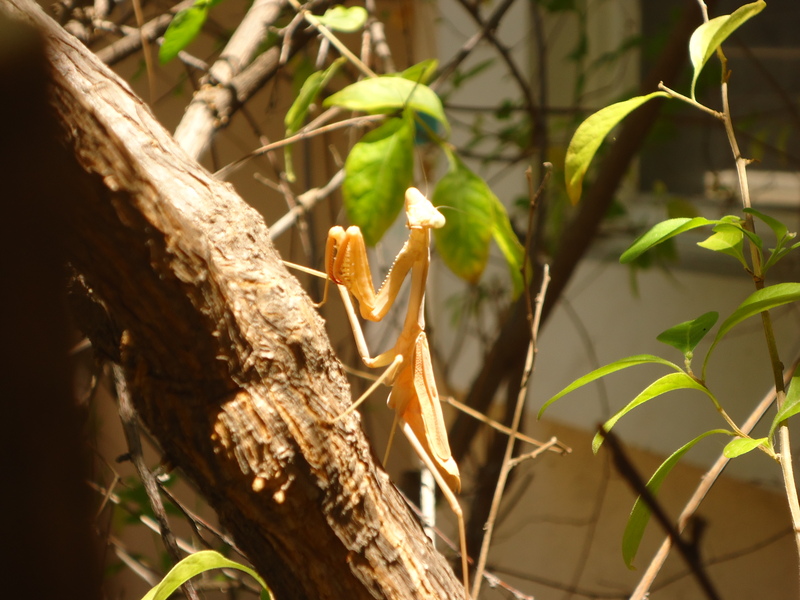 I was very careful to look for any praying mantis. I also went to Home Depot to get some tree truck mulch to put around the pipe and two trees close by; covering anything left and to also cover some tree roots. I like how it gives my front yard a manicured, earthy and fresh look. I then looked down and my heart skipped a beat because I saw her on a small ash tree weed. I showed her my hand and she slowly approached and walked up on it. 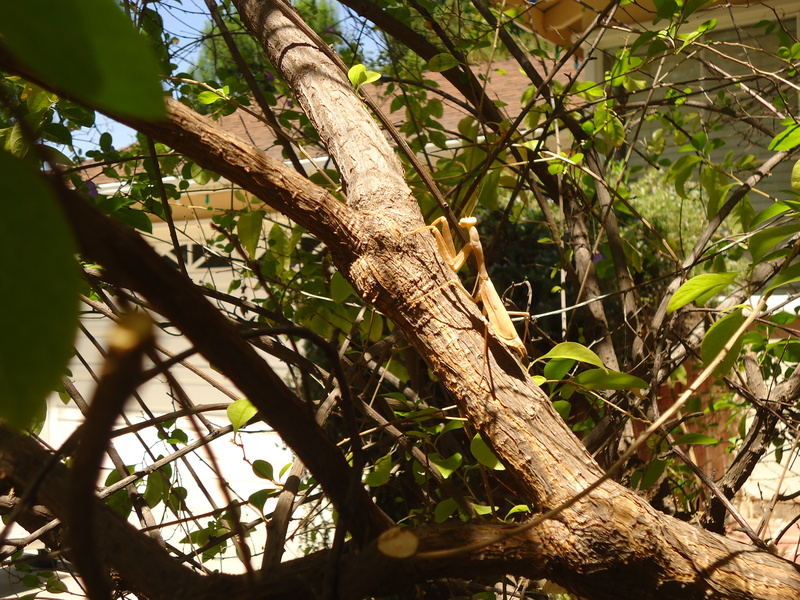 Then I put her up on a solid branch from her tree….she was so close to her place that I had recently disturbed. She posed and looked my way. This entry was posted in Nature Politics, the Esoteric heart beat..., The Praying Mantis and tagged ash tree, beauty, drainage pipe, Hudley Flipside, nature, postaday, Praying Mantis, rubber pipe, sweet autumn, tree roots, tree truck mulch, tree with purple flowers, Underground, Women. Bookmark the permalink.